So 61% of the tuition subsidy goes to students from the top half of the income distribution, and the proportion of the budget that goes to the top quartile is more than twice as large as the share that goes to the lowest quartile. Direct costs (tuition, books, etc) account for only about one-quarter of total education costs. Financial barriers account for only a small fraction of the difference between PSE participation rates of low-income students and those from high-income households. Other factors (eg: liking school) are far more important. Reducing tuition fees would have only a marginal effect on low-income household PSE participation rates. 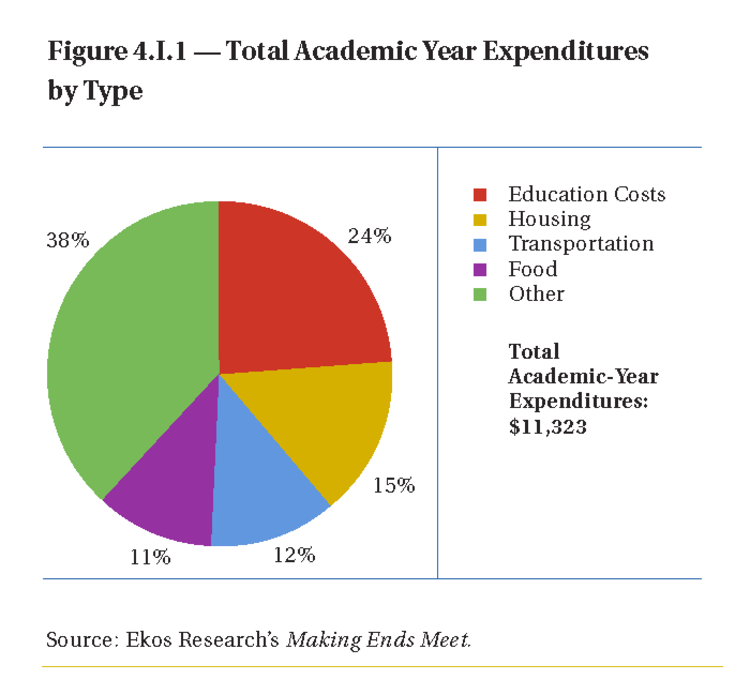 And a disproportionate amount of that extra spending will go to upper-income students. The size and incidence of student debt is growing. The CFS 'solution' to these problems is to reduce tuition fees. But a significant portion of an increased tuition subsidy budget will go to those who are either from upper-income households (35% from the top quartile) or to the 40% of those who graduate without debt. (Clearly, there will be some overlap between these two groups). If the CFS was really concerned with these issues, then it would be campaigning for increased spending on grants and debt relief programs. So why the emphasis on tuition fees? Simple: the CFS represents those who are already attending PSE. These people will - for the most part - not benefit from either grants or debt relief programs. But they will all benefit from reduced tuition fees. Sadly, politicians have their own reasons to overlook the rank hypocrisy of this position. Students provide a large supply of cheap, enthusiastic labour during election campaigns, and they're given to holding loud, embarrassing demonstrations at inconvenient times when they don't get their way. So the proportion of PSE spending that goes to needs-based programs has been steadily falling. Thanks to the hard work of the CFS, the share of the PSE budget that goes into the pockets of upper income students - people who would have gone to university anyway - has been increasing. Update: Why free tuition is like the Bush tax cut. I think post-secondary education should be free, the way that K-12 education is, with the difference in revenues paid for by more progressive taxes. 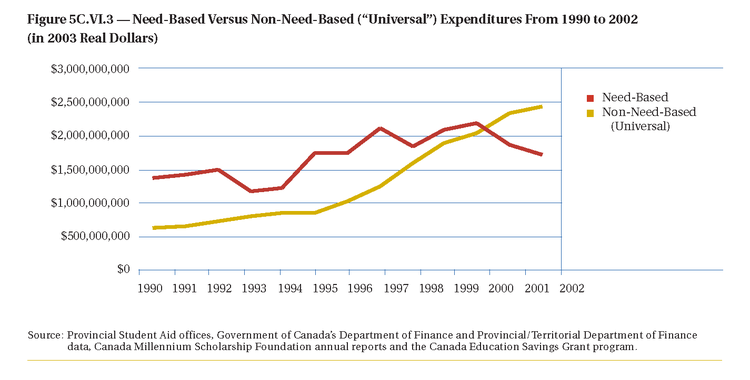 This would address the concern about tuition reduction benefiting upper-income families. I think there is a subtle consequence of higher tuition fees in that students under-appreciate how much post-secondary is still funded by the state, and are more likely to see themselves as having done it alone. With free post-secondary education, people can pay back the investment over a lifetime through a progressive tax system, and will arguably pay their taxes less grudgingly. This would also allow the elimination of student assistance bureaucracies. And it would mean that low income students would not have to go looking a hand-out in the form of a grant or loan to go to school. The latter is a drag on the ability of new grads to be entrepreneurial, as their prime focus upon graduation is debt repayment. It also alters the decision-making of what courses or programs to take -- fewer social workers and more business grads. You are correct that tuition is but one part of the cost of getting a post-secondary degree. But at $4,000 per year (in BC, less in Quebec I think) it is a relatively large one. Given the high social rate of return to post-secondary, making access as wide open as possible is good public policy. So why not free tuition? If we were going to make university attendence compulsory, and invest in the infrastructure required so that students could attend university without moving from their parents' homes - which is how we run K-12 - then I could understand treating university fees in the same way that we handle K-12 school fees. But that's not the case. It's a question of priorities. Regardless of how tax revenues are generated, or how big the PSE budget is, increasing the tuition subsidy will come at the expense of need-based programs. I can't understand how anyone would think that free money for a student from an upper-income household who was not facing financial constraints and who was going to go to university anyway is a higher priority than putting together a financial aid package that would actually make a difference for someone lower down the income scale. If need-based programs had been growing much faster than the tuition subsidy over the past few years, then I could see some sense in re-balancing the policy mix. But that's not been the case, either: exactly the opposite, in fact. For low income students, staying at home while they attend university is already the reality. And current levels of tuition are in fact a barrier for them. I just think that we should not box ourselves into a corner on this issue. It is a question of how we decide to pay for post-secondary. A shift from out-of-pocket tuition fees to the public purse via more progressive income taxes seems a sensible one to me given the benefits to individual students (and the treasury by virtue of higher taxes paid on higher incomes). If we view public finance over the life cycle, there is nothing wrong with upper-income kids receiving a subsidized education, as they will pay it back through their taxes (and in accordance with a progressive tax system) during their working years. Sure - I'm not saying we should eliminate tuition subsidies; I'm just saying that increasing them is not a priority at this point, not compared to need-based programs. Since the govt is going to get (say) half of the increased earning power back in taxes, then it should pay (say) 60% or so of the costs. If you have a system with high tuition fees, then tax breaks or direct assistance to lower income families, will the very fact of high fees prove a barrier, given a limited understanding of the assistance regime and uncertainty around whether a given family would qualify? Would lower fees simply reduce barriers and provide better access, even though being notionally regressive? That's a good point. My immediate response would be to do a better job of making low-income students more aware of what's involved. I had a post awhile ago about an Ontario govt program to target children of parents who did not go to university, so that'd be a good place to start. I believe in "universally accessible PSE" -- that's the European model. In my view, government can cancel all other social programs, but if they provide open and accessible PSE, it'll solve a lot of problems. It would not be a "handout" but a "hand-up" -- giving people the tools to help themselves. Education is the greatest asset anyone can have. Also, with PSE being universally accessible, it would also be easier for people to keep on upgrading their skills or learn new ones -- as we all know, the market keeps changing, and staying in the same career all your life is no longer an option. The point is that free tuition is not synonymous with wider access to PSE; European university participation rates are generally lower than they are here. The money would be better spent helping students who actually need it. University must be open here the way it is open elsewhere -- even Scotland has eliminated tuition fees; if they can do it, then so can we. If numbers is all you've got, then you have precious little. Life is about people and experience, not numbers. I have experienced universal PSE myself, and I know what I am talking about -- hundreds of thousands of enrolled students, no restrictions, no artificial limits, and a huge number of graduates and educated people populating society (unlike Canada, which is becoming more stupid every day). Werner: if anecdotes is all you've got, you're on shaky ground. The numbers are consistently against you. Australia and the US have considerably higher numbers of university graduates than 'universal' European countries like France and Germany. Life might be about life experiences, but it's hard to see why government post-secondary policies should be based on one person's opinion about what constitutes a valid life experience. Werner - I think you may be off track a bit. When I went through university in the UK there were no tuition fees and I got a grant from the local council. But that has changed a lot and the funding load in the UK does not seem to me (from talks with people I know) to be very different from that in Canada - if anything it is heavier there. Marc & Steven - interesting conversation; thanks. Steven said "I'm not saying we should eliminate tuition subsidies; I'm just saying that increasing them is not a priority at this point, not compared to need-based programs." Economists often oppose income-independent programs such as tuition-fee reduction, preferring to argue for means-based programs. Such a preference seems to me to neglect the question of why so many means-based programs have been abandoned in the past in favour of universal programs. The costs of developing means-based programs that work well is often huge. Verifying income requires a large investment, and an effective assessment of means is likely to be a barrier to accessibility, especially for people who most need the program (people who don't spend their lives working with complex bureaucratic forms). To make the case against tuition fee subsidies, I think you have to make the case that efficient needs-based alternatives would work better, and that seems to me far from obvious. Running a needs-based program isn't particularly complicated or costly: governments already know what peoples' incomes are from their tax files. Putting together a formula is a bit of work, but it's the sort of thing govt policy-makers are trained to do. Things like the GST rebate and the Child Tax Credit are already need-based, and I'm not aware of any cost issues there. There's no mystery as to why the emphasis has shifted away from need-based programs to the tuition subsidy. If you're looking to get elected, it's far more effective to sprinkle small amounts of cash to a large group of people who are vocal and likely to vote than to target it on a much smaller group of people in need. Further, a needs-based program related to higher education already exists - student financial aid. Theoretically, those in need of a tuition discount (provided either as a loan or a grant) are already directed to such a program. Yet again, if access to University is universally free, you will find that it used unproductively and some students just don't take it seriously becaise it is free. There needs to be some sort of happy median here.